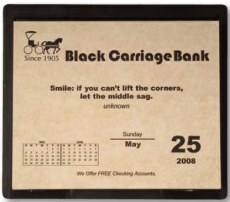 Custom Daily Tear-off Calendars Personalized in Bulk. Promotional, Inexpensive. Lowest prices in USA, Canada. Option: Fully Custom. Our bulk custom imprinted easel daily calendars have one page for each day of the year, except that Saturdays and Sundays are combined into one page. Top quality . Budget Prices in USA and Canada for wholesale personalized daily tear-off calendars . 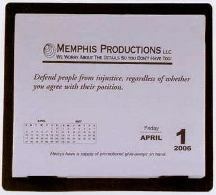 The daily tear-off calendar has a polypropylene stand with hinge on back. The calendar prominently displays your logo on top of every page. The current and the following month calendars are displayed on all pages for easy reference. The date is oversized for easy reading. The back of the calendar is blank, to allow sheets to be reused to send notes. Begin with any month that you wish and run twelve months! Free artwork design. We will send you a proof for your approval before production. Padded and adhered to a polypropylene stand that lays flat or props up for easy viewing. Saturday and Sunday are combined for a total page count of 314. Customer logo imprint on every page and changing tag lines are standard. A different positive thinking message is on every page. 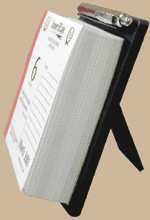 Stand Size: 6 1/8" x 5 1/8"
Binding: Metal Twin loop in black or white. Cover: Either logo imprint on stock paper backgrounds or on your choice of color covers. For a full custom, full color cover, add $40.00. Imprint Color: Black. Call for current pricing on color logos. Daily tag line: Up to 30 different tag lines at no additional charge (tag lines are imprinted at the bottom of each page: see photo). FULLY CUSTOM CONTENT ON EACH SHEET: Only $300.00 per order. Normal Production time : 10-15 business days after art approval. Unit prices below include the same custom imprint (logo) on each page in black, up to 30 different tag lines at the bottom in black, and your custom imprint on the cover in black. Add only $40.00 for full color imprint on cover. 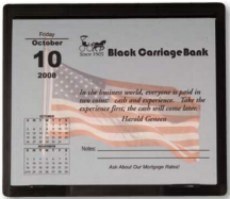 Add $300.00 for fully custom calendars: you may have a different imprint on each page.